Frosted was billed, "The Villan," at the Belmont as he was considered the horse to spoil American Pharoah's chance at capturing the first Triple Crown in 37 years! Frosted odds were 9-2 going into the Belmont. He was trapped in traffic for a good portion of the race only to make a late surge towards the end. The late charge was not enough and American Pharoah won the epic Triple Crown! 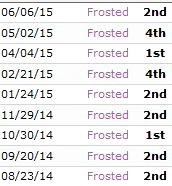 But what happens with Frosted moving forward? Is this the end of his racing career or will we see him back on the track soon? The Summer Horse Racing schedule is quickly approaching. It appears that we may see Frosted as early as the end of August. He may appear at the Saratoga Race Course (G1). The course is 1 1/4 miles and dirt which is an excellent surface for Frosted's galloping ability. Don't be surprised if this Thoroughbred Gallops to the head of the pack!